When they complete a home improvement project, they want the waste disposal to be a simple and quick process. This is why they rent 20 yard dumpsters. It allows for a quick waste removal process. Chuck everything in the big boy! It just so happens, with Bin There Dump That, our biggest container offering, offers you the best value. In this article, we'll examine 7 reasons why the 20 yard dumpster accommodates most home improvement and organization projects. There’s always a big guy on the block and in terms of our dumpsters that would be our 20 yard dumpster. It’s a waste clearing behemoth and it’s probably the biggest one you can fit in the typical residential driveway. 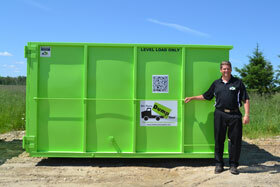 This dumpster also happens to be the most popular size right across the USA – It represents 40% of all our rentals. Our clean, green giant on average weighs in at 1.75 tons and is 6 feet tall and that means it can hold a lot of your waste. Not to worry though, it also comes equipped with a set of double walk-in doors so you don’t have to worry about testing your throwing arm. All you have to do is open up the doors, walk right in, and place your waste where you want it. What Does A 20 Yard Dumpster Cost? The price of this dumpster will vary depending on where you are in the country. The average cost of it is about $350-$550. We recommend you budget around $500 for your 20 yard dumpster rental. Our fees include delivery, pick up, 7 days rental and Bin There Dump That's driveway protection system. 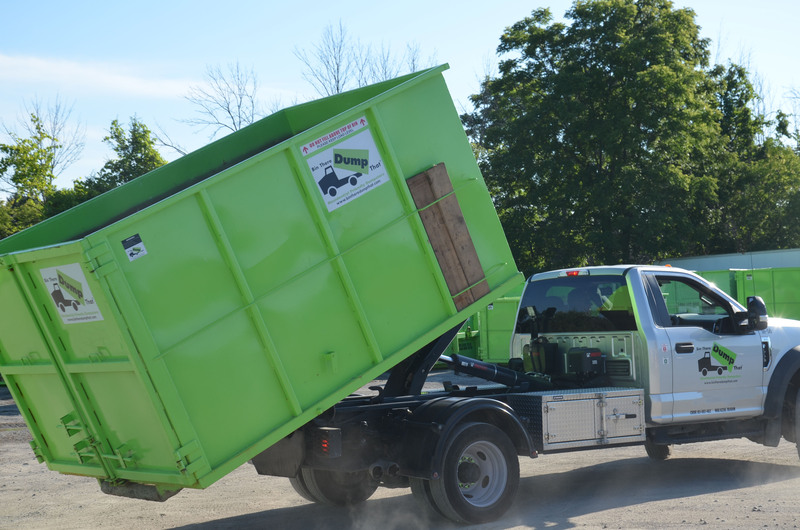 Find your local Bin There Dump That to inquire our Dumpster Consultant about a 20 yard dumpster rental in your area. What Size Is A 20 Yard Dumpster? They are 20 cubic yards. 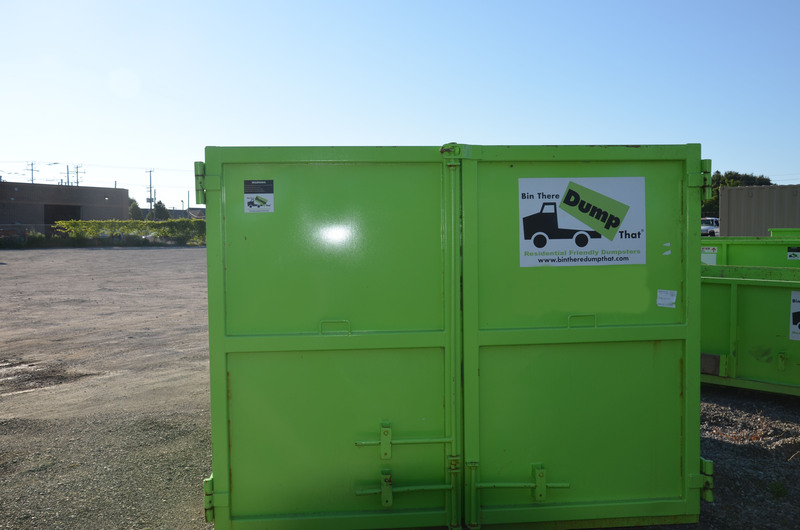 The dimensions of our dumpsters are 11 feet long, 6 feet high and 9 feet wide. This is the largest dumpster we offer and is made to handle all your needs in waste disposal. If you're in need of a visual reference, you can find one here. How Many Tons Can A 20 Yard Dumpster Hold? This dumpster can approximately hold 2.5 tons to 3.5 tons which converts to approximately 5,000 lbs to 7,000 lbs. 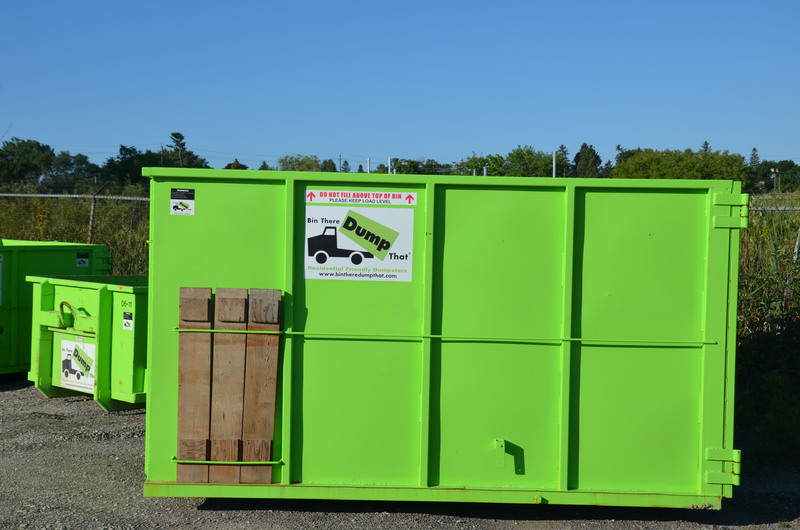 With this much capacity, this dumpster can handle many waste removal projects. What Does A 20 Yard Dumpster Weigh Empty? It approximately weighs 3,040 lbs empty. But the weight of an empty dumpster does not matter, it is the weight of the waste inside that counts. If you’ve booked a couple of weeks off for a complete home renovation time is a factor. Instead of trying to scale down your project to match what you can fit in a smaller dumpster the best solution is to opt for the 20 yard unit. A standard rental is for 1 week, but you can always extend that if need be to give you time to take full advantage of that time you’ve booked off. This dumpster can handle the waste from just about any home remodeling project you have planned. It’s great for a kitchen remodel, a bathroom remodel, and one or two other rooms thrown in as well if need be. You can strip those rooms until there’s nothing left but the walls and bring on the new look. Every homeowner has faced the realization that his or her house has become too cluttered. Our first option is to store the overflow in the basement or that spacious garage, but in a few years’ time, even they can start to fill with the clutter of life. At that point, it’s time to finally make some decisions about what stays and what goes. This trash container is ideal for a major home decluttering project. You can clean out that messy basement and the 2-car garage all in one spring-cleaning session. Off course, you still have to do the work. It’s pretty straightforward though – you can simply walk all those unwanted possessions into a dumpster and then have it hauled away for you. It doesn’t get much easier than that. Our children are the joy of our lives, but they also happen to be some of the worst hoarders on the planet! Everything they own is so important to them – even when they’ve forgotten all about it until you mention throwing it out. It might not be easy convincing them to let go while they’re still living at home, but once they finally leave for college all bets are off. It’s the perfect time to get rid of a lot of unnecessary junk that you couldn’t convince them to part with. We’re always happy when our children come back home for the holidays, but that doesn’t mean we want to be the storage facility for their forgotten belongings forever! Most residential use dumpsters aren’t big enough for larger items. That’s not the case with the 20 yard container. If you have some old bulky furniture that you’ve been meaning to dispose of, there’s no better time than when you have a rented 20 yarder in your driveway. You can open up the doors and walk it right in. Perhaps you watched your neighbor completely revive his backyard last year and you’ve been planning your own rejuvenated backyard oasis ever since. The 20 yard dumpster is great for a large project like this. You can rid yourself of that old shed, dispose of old tree stumps, and some old patio furniture as well. That dream backyard is well within reach. The 20 yarder from Bin There Dump That is so popular because it’s the biggest one you can fit in your driveway. It still fits on our roll off trucks and we deliver them with the same care for your property that we do with every other product we offer. Our goal is to leave your driveway in the same condition it was in before we showed up in your life. This trash container is also big enough to be used on smaller commercial projects. If you’ve hired contractors to completely remodel your basement, it’s perfect for that. They can do their job without the stress of worrying about where to put the leftover waste material and you can stop worrying about the mess they’ll leave around the yard. One of the most frustrating experiences for a homeowner is having to make multiple runs to the dump or landfill. If you’ve ever experienced this you’ll know exactly what I mean. It’s not a whole lot of fun. Fortunately, there’s an easier way. It can also hold a lot of waste material. As long as you’re not trying to rid yourself of chemicals or paint products you can put just about anything in it. Perhaps best of all, you can do it all in one simple project. It holds the equivalent of 6 loaded pickup trucks. That’s 6 trips to the dump you’ll never have to make! If you’ve never considered renting a dumpster for your next major project you’re not alone. Most people’s first inclination is to consider who they know that owns a pickup truck – it seems like the simplest solution. It’s not. When it’s time for a new beginning there’s no better way to remove all of the waste standing in your way than renting a twenty yard dumpster. It doesn’t get much easier. All you have to do is fill it and we haul it away for you. It sure beats making six monotonous trips to the local landfill.